I like cooking because of the instant gratification of creating a product. My new class garde manger is most definitely not that. Our first day “cooking” last week, my partner and I didn’t end up finishing anything. We broke down ducks, brined the breasts to be smoked and cured the legs to be cooked confit style. I then spent the rest of the class pickling cucumbers. 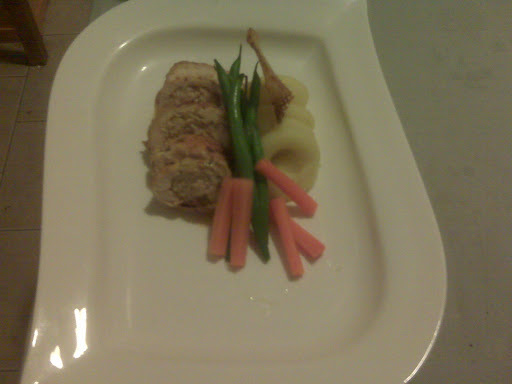 Attempting to improve this dish is giving me a headache. Borrowed a mandolin from a friend to make gaufrettes (waffle cut potatoes) as a garnish for the mashed potatoes. Also instead of just plain chicken veloute sauce, made a creamier/tastier sauce called supreme sauce. Getting sick of the whole chicken stuffed with chicken wrapped in chicken skin thing…but gotta do the dish two more times this week to perfect it for the upcoming competition. Last time lobsters were made they got thrown in boiling water alive. 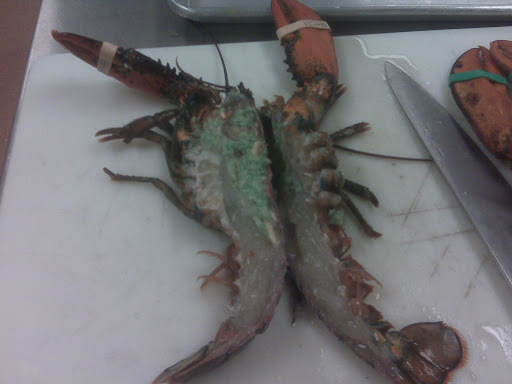 This time we dismembered the still alive (and moving) lobsters. It was an experience that I will never forget. So like everything else in school, every chef has a different way of doing things. The chef from last night had us lay the lobsters on their backs, and pretty much stab it smack in the middle of its body and cut down the middle. I choose the more comatose of my two lobsters to start with, thinking how bad could this possibly be? The first stab was unsuccessful because the lobsters tail curled up and started flapping wildly around. 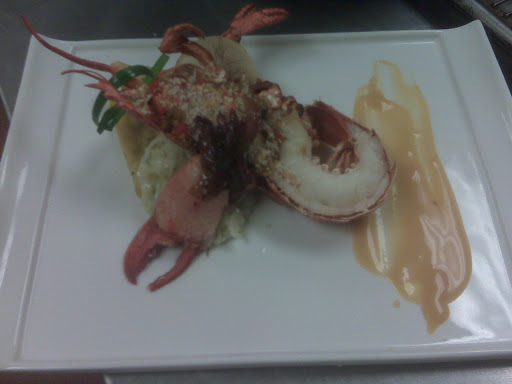 At this point it was a blur, the lobster tried to commit suicide and fell on the floor, kept flailing around as I attempted cutting it down the center, and when it was finally split in half kept picking up and moving around its claw. This is definitely not for me…I think I’ll stick to just throwing them in a pot of boiling water. After the massacre, we made broiled stuffed lobster, a fennel salad, grilled polenta cakes, and attempted a cuisson (which is a sauce made out of cooking liquid). 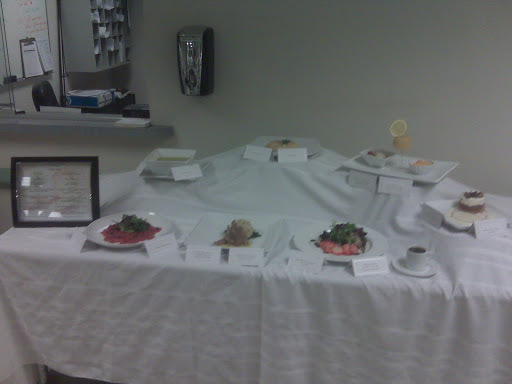 Starting garde manger. Where I will learn how to turn scraps into gold. The more I try to perfect my lamb, the more it frustrates me. This time took the tenderloin off the bone and tried to cook it like that. Ended up with overcooked meat. 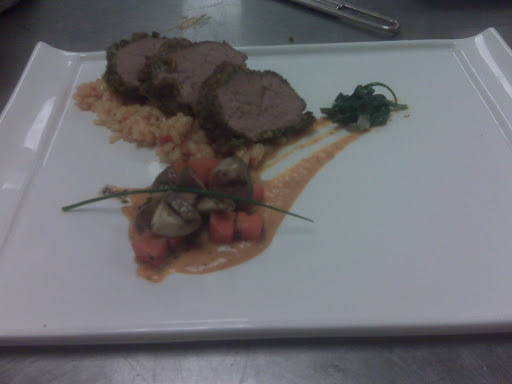 Served with roasted red pepper risotto, tomato basil sauce, and sauted mushrooms & carrots. All I can say about this is that I'm glad its over and that my group and I survived. And no one cried! 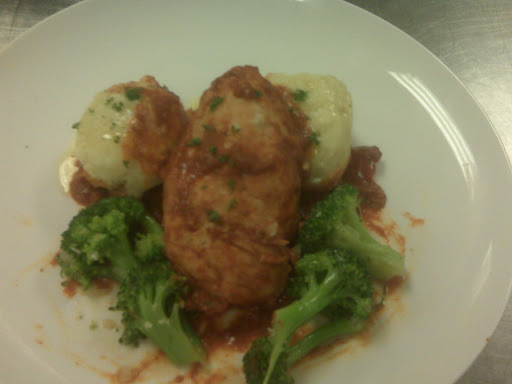 Pulled the Eastern European dish of paprika chicken, potato dumplings, and a vegetable of my choice (I chose broccoli).